Leaving behind my daughter with the parents at the wonderfully named and rather cute Mahogany Beach, we took a taxi to the Falls. A tip would be to inform the taxi driver not to leave the parking. 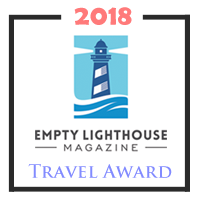 We didn’t, and as a result, thinking that we would take longer than we did, he decided to take another fare, while we were left waiting and a little frantic about missing our ship. 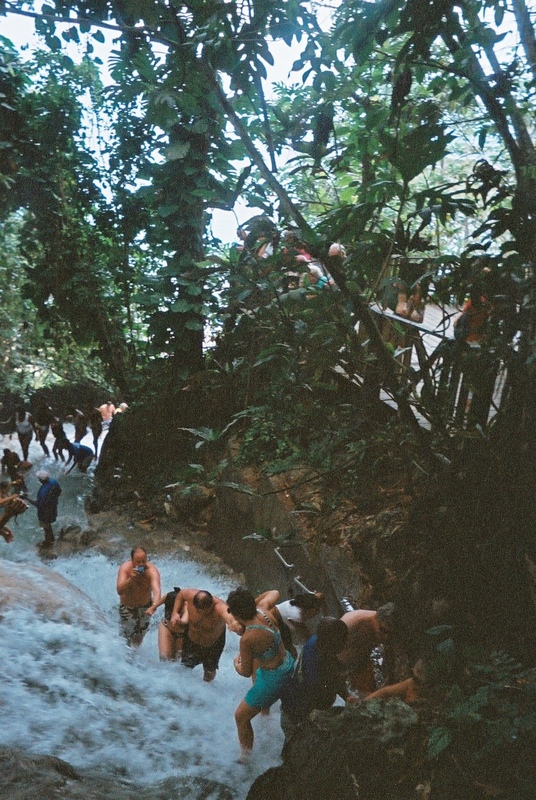 Dunn’s River Falls is one of the primary and most-visited tourist attractions in all of Jamaica and is quite well-managed to avoid being over-crowded – even if it does look like that in some of the photos. A ticket of US$ 20,- got us in and into a group led by authorised guides. There are lockers inside the property to leave your valuables, and it’s advised that you use them because the falls can be a bit challenging at times. Also available on location are water shoes which can be rented for a small fee. 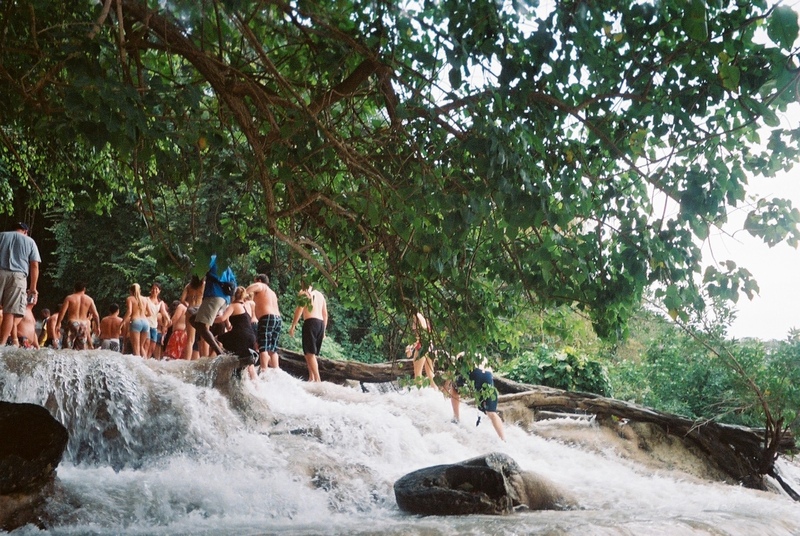 Once again, it is advisable that you rent the water shoes as the rocks, while climbing up, are extremely slippery. Alternatively, before the car-park of the falls, locals have stalls renting water-gear which can be bargained for and gotten a little cheaper. Carrying a video camera, the guides also make a video of your whole “expedition” up the falls which can be yours for US$ 40,-. 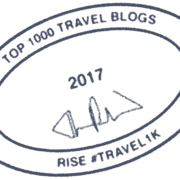 A bit expensive, we gave the video a miss, but the guides were not at all pushy about it. They were friendly and as expected flirted with the girls, at the expense of the guys, but then that’s become so common now anywhere you go. The areas where the flow of the water is strong, the climb a bit steep, or the rocks are really slippery; there are handlebars on the sides to provide support. Moreover, walking in a group, a human chain is usually formed to give the necessary balance to everyone. 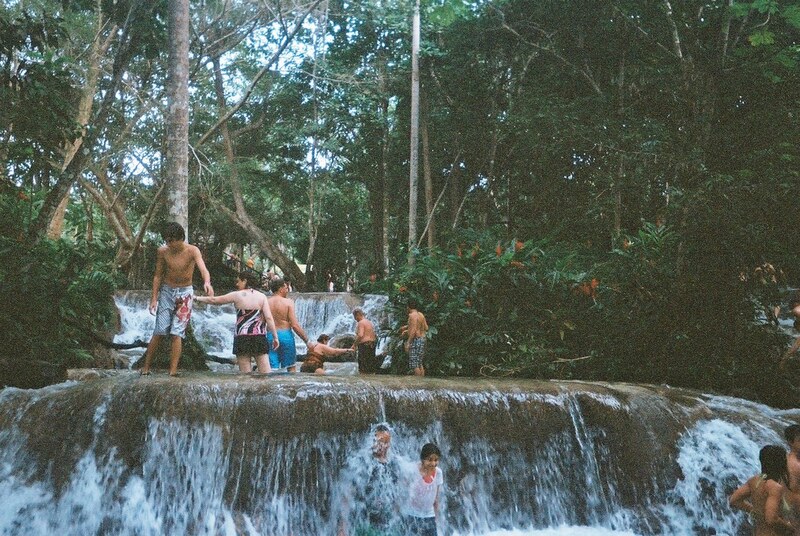 Although I saw people of all ages go up the falls, I would advise the really young and the really old to skip climbing the falls. There is a good chance most people will end up with tiny cuts and scratches by the time they reach the top, but that is not to say that this is a dangerous activity. 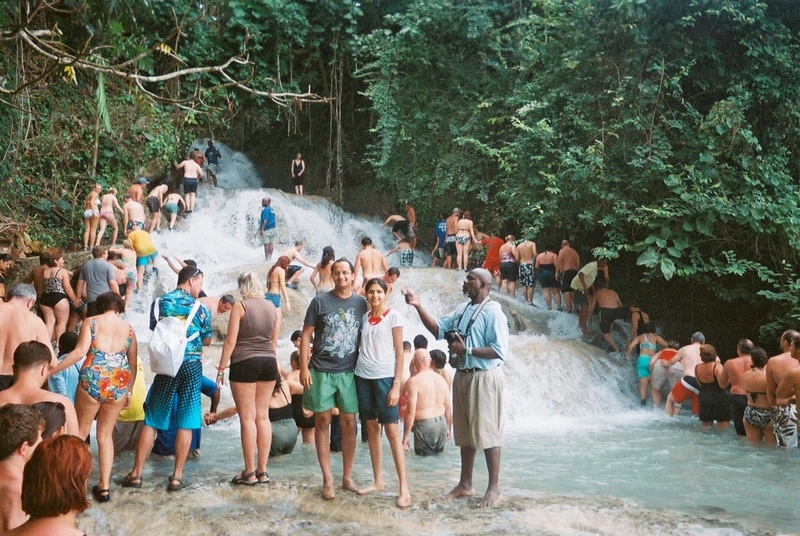 Dunn’s River Falls is one of those attractions that you want and need to have on your bucket list. The sound and sight of the gushing cool water amidst the thick green vegetation, the joy of falling back into plunge pools, and the excitement of the climb is immensely refreshing and something I definitely recommend for everyone visiting the region. Once you have had your guided climb, you can always go back down and climb up again if you desire. And this time around you can take your time and stop for longer in-between to enjoy the small waterfalls and pools at a leisurely pace. 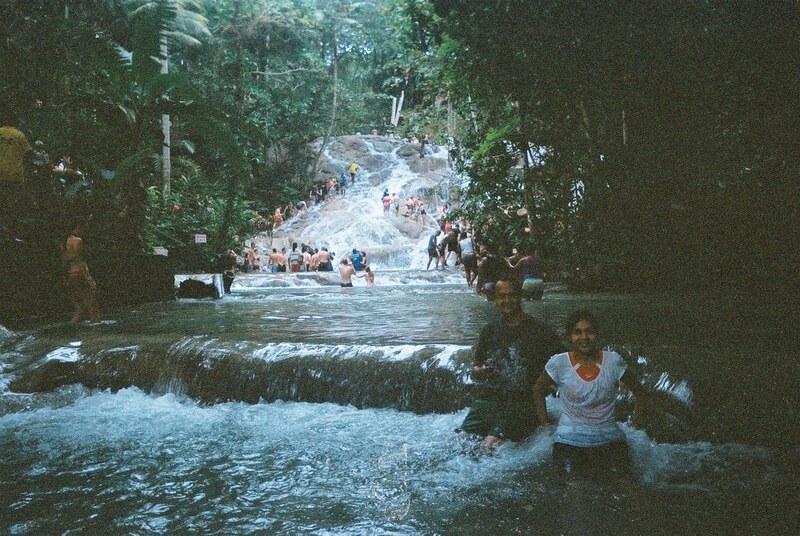 There is also a small beach at the bottom of the falls which is fun for the younger and older members of the family, but if you want to save some money, then it’s best to explore the other “free” beaches especially if one doesn’t plan to climb up the fall. While we spent time clambering up the falls, our daughter and parents enjoyed playing at Mahogany Beach and even got to witness a regional “comic” dance performance. Unexpected and fun at the same time. However, the falls are not the only attraction in this region. 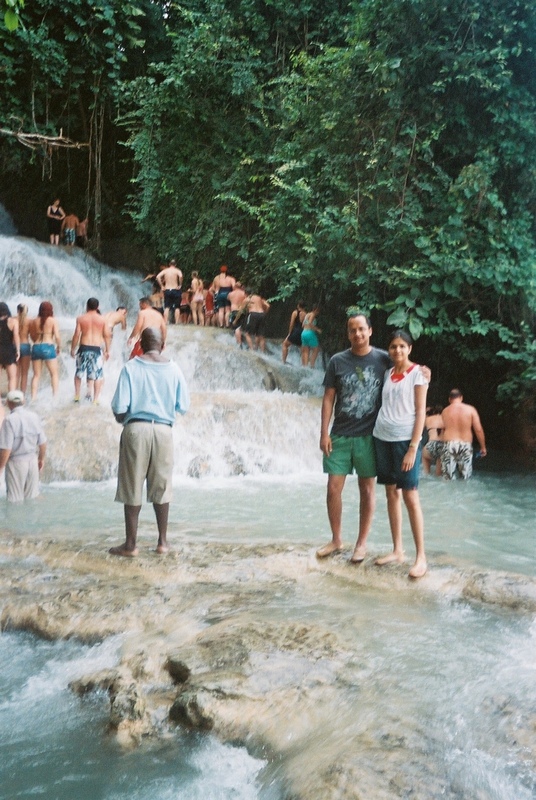 There is an abundance of things to do in Ocho Rios, each one packed with culture, traditions, food, and of course astounding sights. 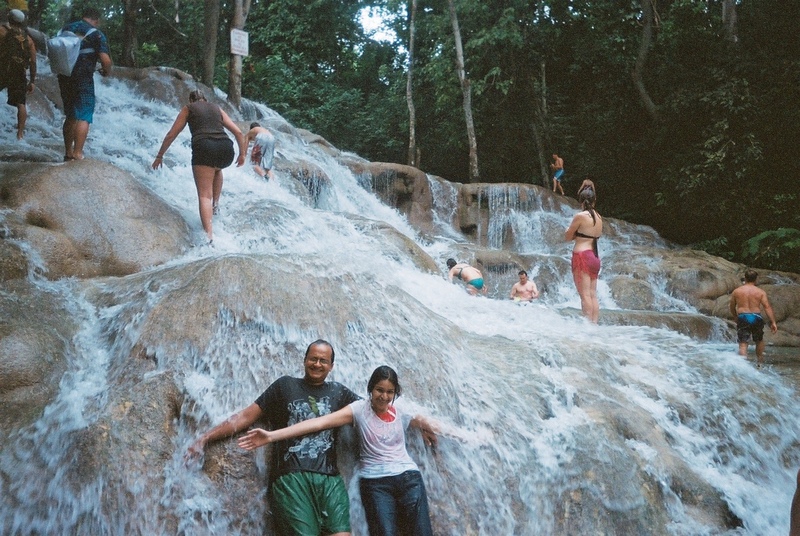 There is so much natural beauty around us that is not accessible, so places like Dunn’s River Falls gives even amateur adventure enthusiasts a chance to experience the wonders of the world from up close and get the type of high that is often hard to find living a city life. 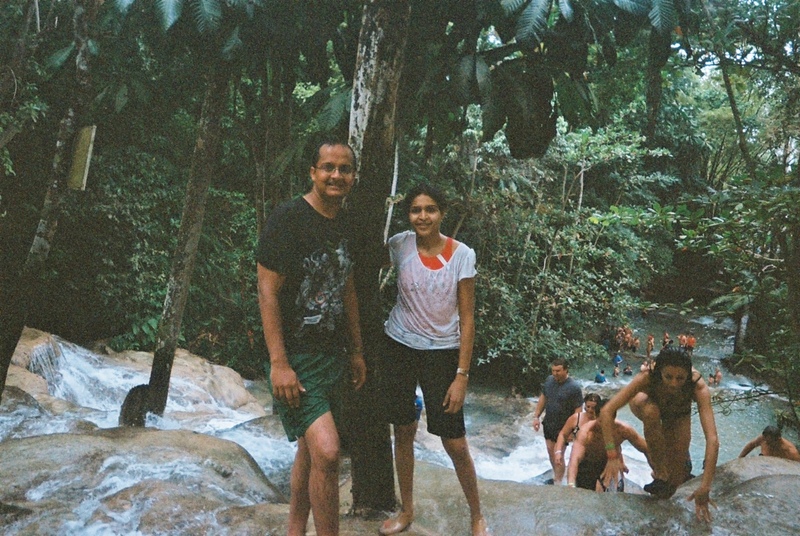 We just took our kids up the falls. We weren’t sure if my youngest could do it, but he did. We took a tour with our cruise, because I was stressed about missing the ship. 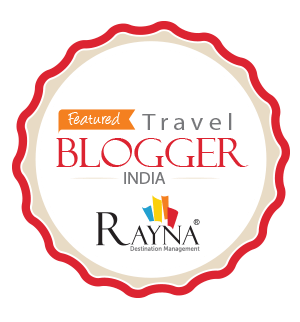 I think taking the Cruise tours is a good idea, because as you said, it takes away all the headache and they are usually well organized. 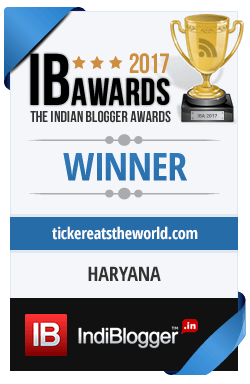 Glad you enjoyed it and the little one also managed to do it. Great tips! 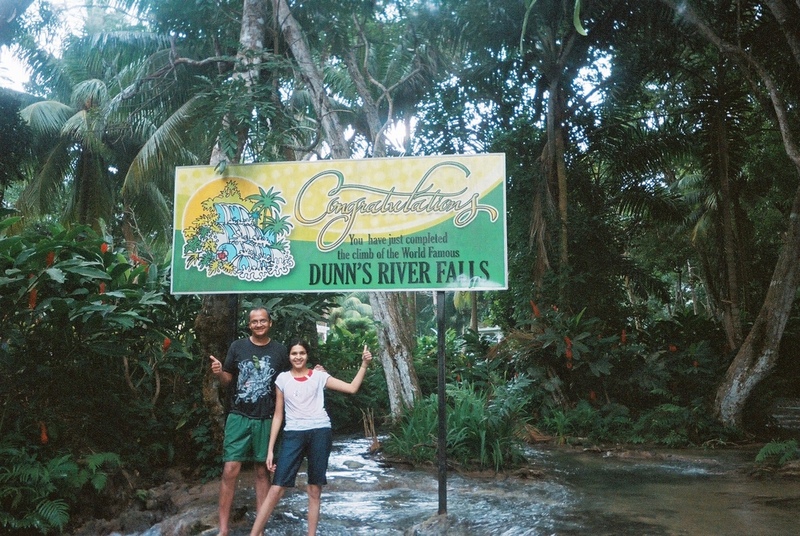 Next time your in Jamaica, visit the recently opened mini water park & central gardens at Dunn’s River Falls. I share the same sentiment about really young and old climbing the falls, always hold my breath lol. Glad you enjoyed it here, it’s a shame you didn’t have a longer stop.